Tungsten carbide wedding rings and bands for women are made of materials that can withstand any amount of abuse a woman can give them. You might want a band that matches his, or one that is simple and elegant. Tungsten bands won’t be ruined by the situations you find yourself involved in from cleaning chemicals to woodworking to running machinery. If you’ve been worried about having a ring that might get ruined, you can relieve yourself of that concern with Tungsten carbide wedding bands. They’re scratch resistant and won’t bend or warp on your finger. 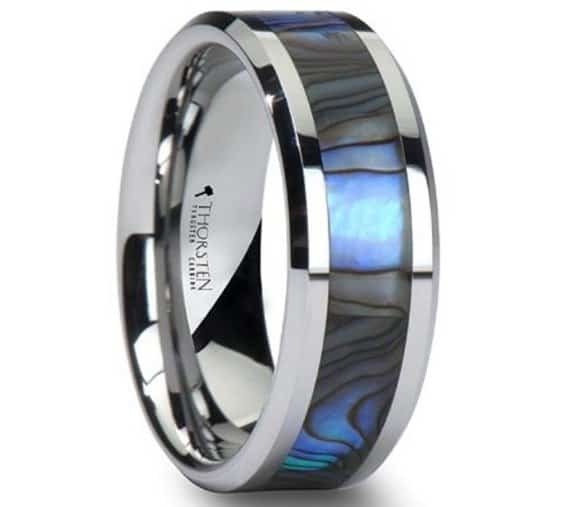 This Tungsten wedding band has an inlay of natural Abalone Stone, which gives the ring its Mother of Pearl design. The design is like the waves you’d see in the ocean with purples, greens and blues, and is perfect for those who love color in their life. This is a beautiful choice whether his ring is black or gray, too. You’ll have a matching ring, yet, one that has your own unique, personal style. When purchasing from Thorsten Rings, they offer a lifetime warranty of their product as well as engraving for your wedding band. The Tungsten carbide ring measures 8 mm in width and has a range of sizes from 5 to 13.5. For those women who love constant change, the Stingray Tungsten Carbide ring is a delightful change from traditional rings. The one-of-a-kind design features an inlay of a special material that changes colors depending on the angle from which you’re viewing. The hues of blue and purple will change as the ring is moved. Surrounding the inlaid color, the Tungsten edges are beautifully beveled. The rings are available in three width sizes; 6 mm, 8 mm and 10 mm. Instead of having a ring that matches his slightly, you can choose to have the exact same ring to really show your bond. It comes in sizes 5 to 14. While Tungsten carbide is incredibly scratch resistant, care should be taken with the carbon insert. It’s not as resistant to scratches or wear as the exterior material. Laser engraving is available for the ring, and it won’t delay the delivery time. inlay of Tungsten. The marking inside says diamond and Tungsten Carbide. The outer edges of the ring are beveled for a beautiful transition from the brushed material and her finger. It comes in sizes 4 to 9.5 and provides a true comfort fit, which means you’ll get incredibly accurate sizing. This is an important consideration for Tungsten rings since they cannot be resized. Sabrina Silver makes their Tungsten rings without using cobalt. The cobalt alloy used in Tungsten and other metal rings is what can give people an allergic reaction. This makes the Tungsten ring hypoallergenic. This beautiful Triton Tungsten Carbide Rose ring has a raised, brushed rose-tone center. The color of the ring comes from nano-technology that actually add high scratch and wear resistance to an already tough metal. This increases its durability, so it’s a stunning ring that will last a lifetime and could eventually come to be a family heirloom. Triton provides a guarantee for their products that will give you added confidence when purchasing one of their Tungsten rings. In fact, their slogan is “Strength Meets Style.” They’re available in half sizes from 8 to 13, so you can find the exact size that will fit you perfectly. 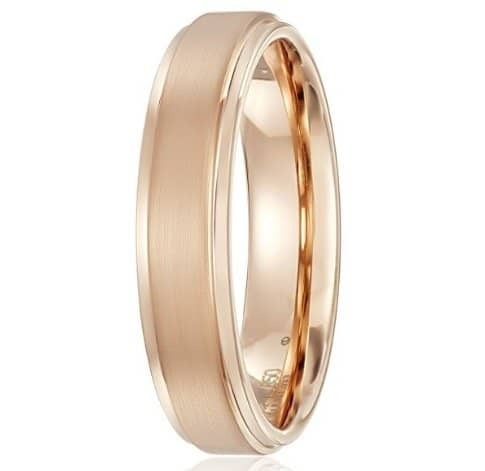 This last choice on the list of Tungsten carbide wedding rings and bands for women is truly unique. It’s an EMBER Domed Tungsten Carbide Ring. 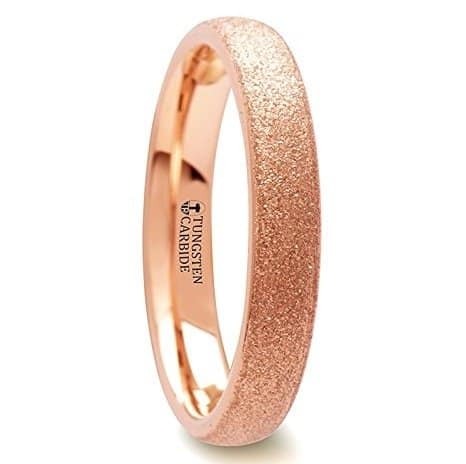 It comes with a rose gold finish that’s been sandblasted to give it a wonderful texture. The sandblasted texture makes it look like there are crushed crystals embedded on the surface of the ring. It’s rounded and comes in two widths: 4 mm and 8 mm. It comes in sizes 3.5 to 12, so both men and women can certainly purchase one of these wedding bands. This stunning ring is definitely not your traditional wedding band. The wedding ring is sold by Thorsten Rings who provide their customers with a lifetime warranty and allow them to exchange for sizing without fees. They also provide a free engraving service for their customers. These Tungsten carbide wedding rings and bands for women are great for those who can’t wear traditional rings. 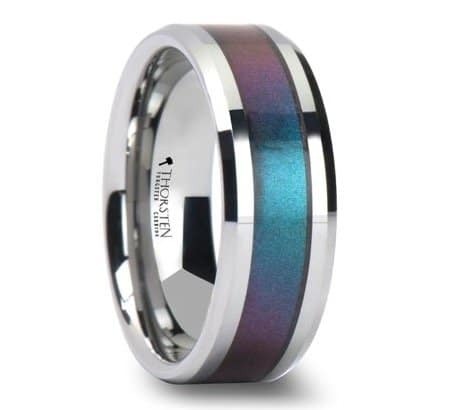 Tungsten carbide rings will stay beautiful, shiny, and resistant to scratches for the life of the ring itself. They come in a variety of sizes, so you can pick one that will fit your perfectly as well as providing a couple with identical rings to symbolize their bond together.